The random question for Currently this month is, if you entered a pageant what would your title be and what would your platform be. This is an easy answer for me and it will also help the problem of poor quality work. I absolutely love office supplies – gel pens, post-it notes, colorful paperclips . . . . you name it, I love it! I always felt like my love of office supplies was my secret weapon to combat craziness in the classroom. You know those times of year when your students forget every rule and procedure of your classroom. Suddenly, their classwork regresses 2 years . . . UGH! I hate that time of year. When my students catch the craziness bug, I bring out my secret weapons – my prized office supplies. I keep a school supply box of special gel pens, another supply box of glitter crayons, a box of glitter pencils . . . . you get the picture. I bring out my special boxes with a flourish and then explain that the team or student who is showing “above and beyond” work will get to use my special supplies. Other times I choose students who are working super quiet. Suddenly, the quality of work increases and my room is so quiet you could hear a pin drop. If your students have caught the “C” bug, you might want to try the special office supplies treatment, too. I bought a set like these at Costco a few years ago. Totally worth the money! I use supplies that students normally don’t get to use. It is extra special when you are in kindergarten or first grade and you get to complete your word work assignment with your teacher’s special gel pens or colored pencils. These aren’t something that they use very often so they take their time completing their assignment. I am linking up with Farley @ Oh Boy Fourth Grade for her Currently linky party. Glitter overload!!! And loving every minute of it!! I'm having my first linky and I'd love to have you! I ♥love, ♥love, ♥love this post! I love, love, love school supplies too! Why worry about growing up, become a teacher and get new supplies every August! I have always loved getting new school supplies. It is my favorite teaching shopping trip of the year! I follow you but am popping over to say hi today from A Teacher's Treasure giveaway. LOVE the glitter and I love office supplies too!! such a great idea!! I'm popping over from A Teacher's Treasure for their giveaway!! I'm a new follower! UGH! I totally should be doing laundry too!!! 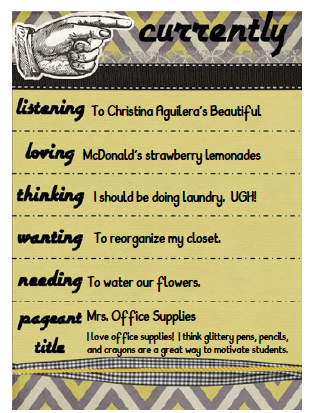 And, I LOVE office supplies~I think that's just a trait all teachers have. Love your blog and I can't wait for summer so I can come back for a much longer visit for fresh new ideas! Would love for you to visit my lil blog. I'm a big fan of shiny! I also believe in bribery… er… incentives! Another great post! I have never thought of that! Glitter pens to encourage their love of writing again. Hmmmm. I will definitely have to put that in my bag of tricks! What a fabulous idea! I found this from Pinterest! what a great idea…i usually try to excite them with a snack or something to that effect…this idea is organized & if i love using colored gel pens & I'm almost 40 years old then an 8 or 9 year old would be over the moon!!! Forget the student, I want to use all the glitter supplies!!! So much more effective than than the drill sergeant approach that I usually adopt! What a fantastic idea! I love school supplies too! I'll be trying this Monday! Thank you!